If it’s your first time in a kitchen, it’s good for you to know some easy, fast and cheap food recipes. Here’s a list of 5 easy meals you can cook on your own for the first time. One of the most simplest and nutritious food in the world: this is a great quick meal at any time of the day. Crack the eggs into a mixing bowl with a pinch of salt and beat well with a fork. Heat some olive oil in a frying pan on a low heat, once the oil is heated, add the eggs and move the pan around to spread them out evenly. Use a spatula to ease around the edges of the omelette, then fold it over in half. When it starts to turn golden brown underneath, remove the pan from the heat, slide down on a plate and serve. You can serve your omelette with wholemeal bread and a simple tomato salad for a healthy, balanced meal. It’s cheap, easy to cook, and you can use this food in endless ways. Fill a large pot with water. Add some salt, bring the water to boil over a high heat, then add the pasta and stir. Reduce to medium or medium-high, cook for 8 to 10 minutes, then drain cooked pasta well in a colander. If you’re making a pasta salad(as below), run the pasta under cold water to cool it. Penne with baby plums, mozzarella(or white cheese) and basil. How to cook: Once you’ve returned the pasta to the pot, mix it with the ingredients above. Add sliced or grated courgettes and let them cook for a few minutes. 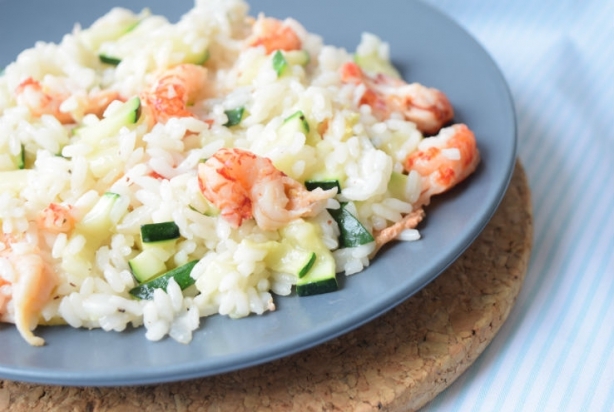 Five minutes before the risotto is ready, add the prawns. The rice will take about 18 to 20 minutes to fully cook. It’s healthy and really appreciated for its nutritional properties. This food is recommended in a balanced diet and is rich in protein and low in fat. Add some oil in a baking pan or baking sheet. Toss all the ingredients together in a big bowl then spread them out onto the prepared baking pan. Place into oven and roast for 45 minutes or until the chicken is completely cooked through. Is there any easier food to cook than salad? Why don’t you try to add chicken to it? Boil the chicken breast in slightly salted water for about 10 minutes, then cut it into small pieces and let it cool. Wash the lettuce and cut. Put it in a salad bowl with the chopped tomatoes and peeled cut carrots. Add the cold chicken breast and season all with vinegar and a pinch of salt. Mix and serve, accompanied with bread or pitta. Feel free to add any other ingredients you like! If you need more tips check out our blog page.